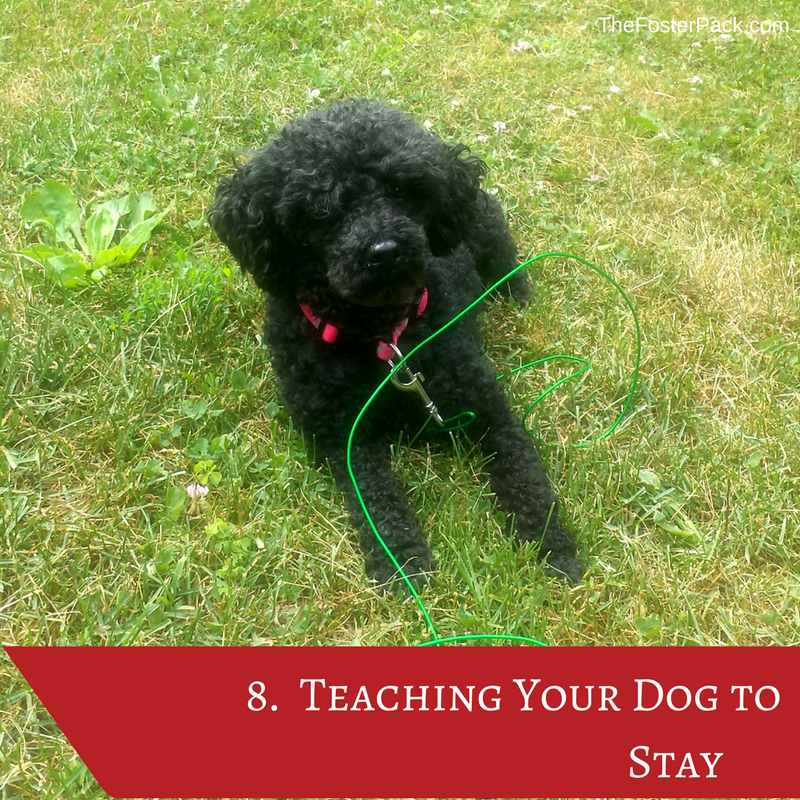 It’s important to teach your dog to stay. Putting a dog into a Stay can keep him out of dangerous situations, and keep him out from underfoot when it’s needed. It’s also great to tame dogs that like to dart out the door as soon as it’s opened. A successful Stay happens when your dog does not move at all from the original position. Teaching your dog to Stay may be a little more difficult than teaching them to Sit or Lie Down. It goes against their natural behavior, instead of working with it. But most dogs catch on within a few days of regular training sessions. To start teaching your dog to stay, they will need to know Sit and/or Lie Down commands already. How to teach your dog to Stay. Get out your [amazon_textlink asin=’B00K79ZIFQ’ text=’high value training treats’ template=’ProductLink’ store=’fosterpack-20′ marketplace=’US’ link_id=’16eb0967-4cdf-11e8-bcb1-e3a14a8954db’] again. Yes, dog training requires lots of treats, just make sure to adjust for their extra caloric intake during meals. You don’t want them gaining extra weight from dog training sessions. Some dog trainers recommend working with your dog on a [amazon_textlink asin=’B000Y8YRG6′ text=’long leash’ template=’ProductLink’ store=’fosterpack-20′ marketplace=’US’ link_id=’33f71a03-4cdf-11e8-81fa-051b915998a1′]. I like to start indoors, because there are too many distractions outside, that I can’t control. So I don’t start working with my dogs on a leash. Once I can be out of the room, and they continue to Stay, we’ll go outside and work on it some. Start by putting your dog in a Sit or Lie Down position. You will want to work with the dog on Stay in both positions eventually. So that they don’t associate it with only one or the other. When you need your dog to Stay for more than a few minutes, it’s always better to have them Lie Down instead of Sit. Say Stay, while holding one hand up, palm facing the dog, as in a stop sign. If your dog stay still, even for just a few seconds, give him a treat and lots of praise. Release from Stay with your release command, such as Okay, or Go. Repeat steps 1-4 a few times, making your dog wait a few seconds longer each time. As soon as your dog seems to be getting the hang of it start gradually moving further away. Remember to practice with your dog in both a Sit and Lie Down Position. Keep practicing a few times a time, and you’ll be able to teach your dog to Stay in no time. Remember to keep your training sessions short, so that your dog doesn’t get frustrated or bored. Keep practicing until you can leave the room, or be out of sight and he continues to Stay, even with distractions around.